Sober Look: Ready to invest in a domestic bank-issued bond in China? You will soon have the opportunity. Ready to invest in a domestic bank-issued bond in China? You will soon have the opportunity. 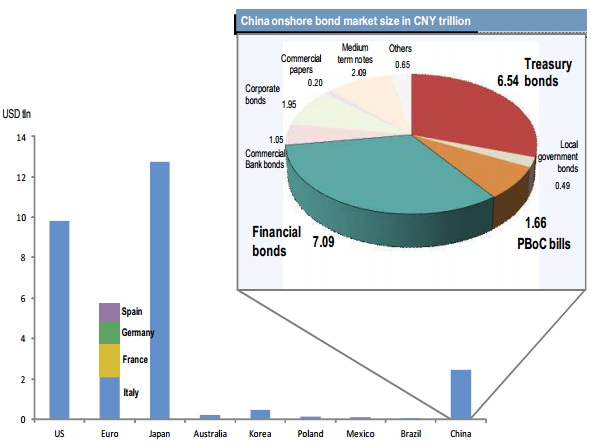 China's onshore bond market has grown to become the 4th largest debt market in the world (assuming the Eurozone is a single market). And the biggest component of the market is bank paper. China’s banks have borrowed a great deal of money domestically. But now these banks are looking for financing from abroad and the authorities are making it possible for all the lucky foreigners. JPMorgan: - China CSRC (ie. the China Securities Regulatory Commission) just released a statement that participants in the QFII program (ie. Qualified Foreign Institutional Investor program) will now also be allowed to buy bonds in China’s large onshore interbank market. Previously, QFII investors were restricted to exchange-listed shares and a very tiny amount of exchange-traded bonds (ie. less than 2% of the size of the interbank bond market). So if you are ready to invest and have your renminbi account open, there will be plenty of bank-issued bonds for sale - 50 times more than is available now through QFII. Just make sure you are ready to lose all the principle should one of these banks get bailed out. Because it may be a bit tricky for a foreigner to attempt recovery of a claim against a government entity in a Chinese court.